If you're on our Enterprise plan, you have access to the custom lists feature. 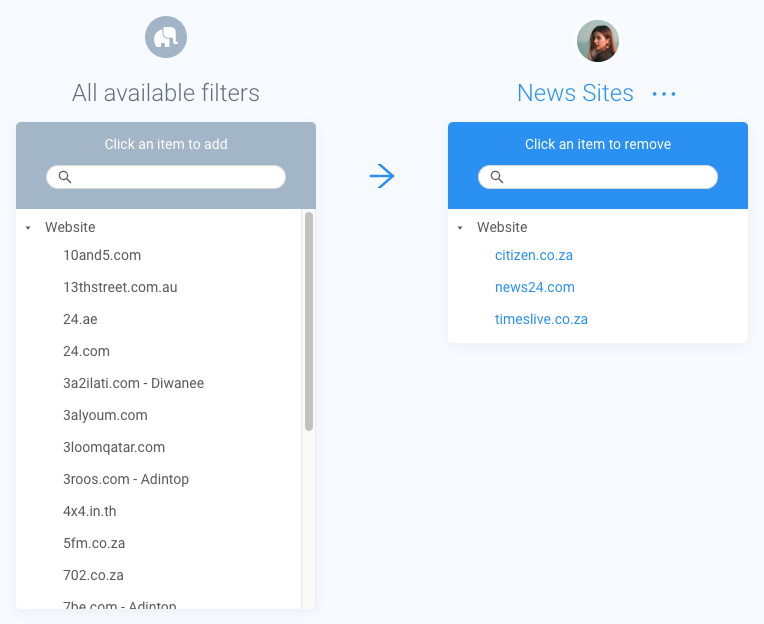 This feature lets you build a list of filter criteria that you use frequently, which you can then use as a shortcut in the market and target filters. My Assets - add all your sites to a list and easily filter by your assets. Demographic Profiles - if you have a list of common attributes that you filter by (e.g. gender, age, profession, etc), add these to a list with a friendly name and filter by your chosen profile in just a few clicks. Regions - add the countries of a region (e.g. the GCC) to a list and easily filter by that region. Mobile Devices - Narratiive provides granular device reporting, but this means a few clicks to filter by all mobile devices (i.e. Smartphone, Tablet and Unknown). Add these device types to a list to quickly filter by mobile traffic. Once you've created a custom list, others in your team can use it in their queries, however only you can update your lists. Custom lists are available to teams on our Enterprise plan. This feature is in BETA. If you're on our Enterprise plan and would like to test custom lists, get in touch with our team and we'll enable them for you. You can create a list from any query within a workspace that you're a member of. Select Add new list from the market or target filter selector. Find the filter criteria that you want to add to your list from the "All available filters" list. Select that filter criteria to add it to your custom list. The criteria will appear in the list on the right hand side. To remove a criteria from the custom list, select it again from the list on the right hand side. Repeat steps 2 - 3 to add more filter criteria. Name the list as something recognisable. a. Select the options menu. The options menu is represented by ellipses (...). c. Type a name for the custom list. d. Press the return / enter key on your keyboard, or click / tap away from the name. Click / tap outside the custom list window. The custom list is saved and available for use in any of your filters. You can add your custom list as a filter criteria in any query within a workspace that you're a member of. Expand My List within the market or target filter selector. The custom list is added to the filter. The list acts as a shortcut for the individual criteria within it. In the example above, Mobile Devices is the equivalent of individually adding the three device types Smartphone, Tablet and Unknown. You can modify any of your lists to change the criteria within them. Select the edit menu (the pencil icon to the right of the list name). Update the list following the instructions in Creating a custom list, above. Modifying a custom list will affect all queries that use the list, including queries created by other team members. You can remove any of your lists if you no longer require them. Select the options menu. The options menu is represented by ellipses (...). The criteria within the list will stay applied in all queries that used the list, though it won't be available to add to queries.